This 5 megapixel Eizo RX560, high-brightness color monitor has the high-definition display necessary for breast imaging. It combines ease-of-use, such as a narrow bezel design to help your eyes swiftly move from one monitor to another, with new functions to help you focus on your work and maintain high performance. 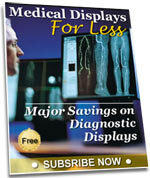 The Eizo RX560 is the world's first medical monitor to use low temperature polysilicon (LTPS) liquid crystal display. Because of this, the color monitor can reach a brightness of up to 1100 cd/m2, similar to that of monochrome monitors. 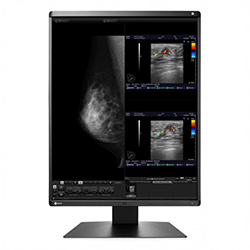 Due to this high brightness, the Eizo RX560 can display high-definition monochrome breast tomosynthesis and mammography images with deep blacks and no washout in addition to color images such as ultrasound and pathology. In addition to breast tomosynthesis and mammography monochrome images, which require high display performance, the Eizo RX560 also faithfully reproduces color images such as breast MRI and CT, ultrasound, and pathology. This ultimately improves efficiency by allowing both monochrome and color images to be viewed on one screen.